At Whitehead Environment Land Clearing, we specialize in underbrush clearing via mulching, which is the most eco-friendly way to dispose of brush and tree debris. 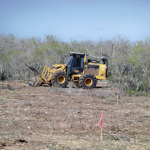 We use special underbrush forestry-mulching equipment to provide fast, efficient, and eco-friendly land clearing. Underbrush clearing is a less intense version of land clearing, where brush is carefully removed rather than scraping the land down to the bare dirt beneath it. 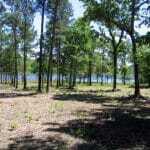 Underbrush clearing usually involves both mowing and hydro-axing. Mowing is used for weedy areas and hydro-axing is best for areas with dense growth, but both provide mulch to enrich your topsoil. Underbrush clearing with our Hydro Ax mulching equipment can be done with minimal disturbance to delicate topsoil, keeper trees, and desirable vegetation on your land in Houston and the surrounding areas. The mulch helps minimize ground pressure disturbances and negative impacts upon saplings and roots. Conventional land clearing efforts damage the feeder roots and/or trunks of nearly every remaining tree, not to mention the topsoil. The mulch is spread evenly over the entire cutting area. This retards initial regrowth, prevents erosion, and replenishes the topsoil base. Unlike other land clearing methods, underbrush clearing leaves no brush piles. 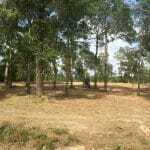 The landowner is left with a fresh carpet of mulch, which naturally decomposes into rich topsoil. Most importantly, mulching is faster and more cost effective than traditional land clearing methods. 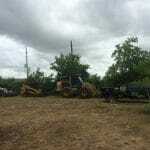 The Whitehead Land Clearing team is ready to help you!